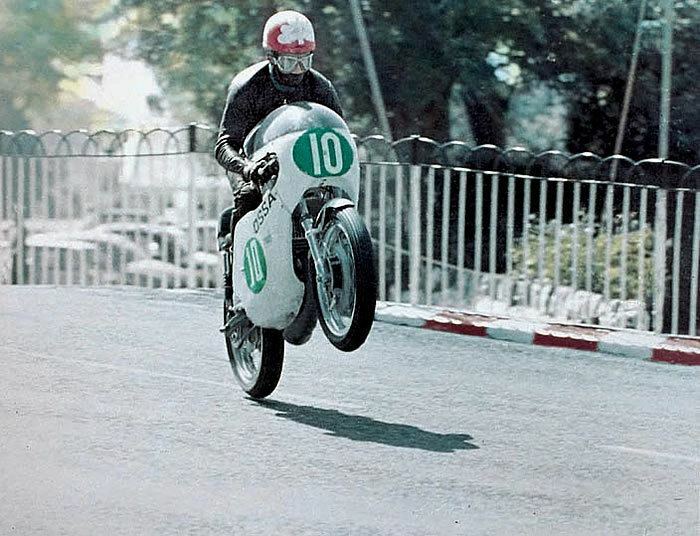 Herrero becomes airborne at Ballaugh Bridge on his way to third place at the 1969 Isle Of Man 250cc Lightweight TT on the monocoque Ossa. The 2017 MotoGP season once again saw Spanish riders dominating the Grand Prix grid. Ten of the regular twenty-four racers were Spanish, and for the past six consecutive seasons, a Spaniard has won the MotoGP World Championship. The junior Grand Prix classes of Moto2 and Moto3 also have a healthy representation of Spanish talent, and it’s also a Spanish company, Dorna Sports, who hold the commercial rights and play a major role in shaping the series. So it comes as no surprise that the popularity of the sport is so high that four of the eighteen races are held in that country. Although Salvador Canellas won Spain’s first Grand Prix victory in 1968 contesting the 125cc class at the Spanish Grand Prix, it was a 17 year Angel Nieto who competed in his first Grand Prix in 1964 in the 50cc class that would spearhead Spain’s assault on the World Championships. 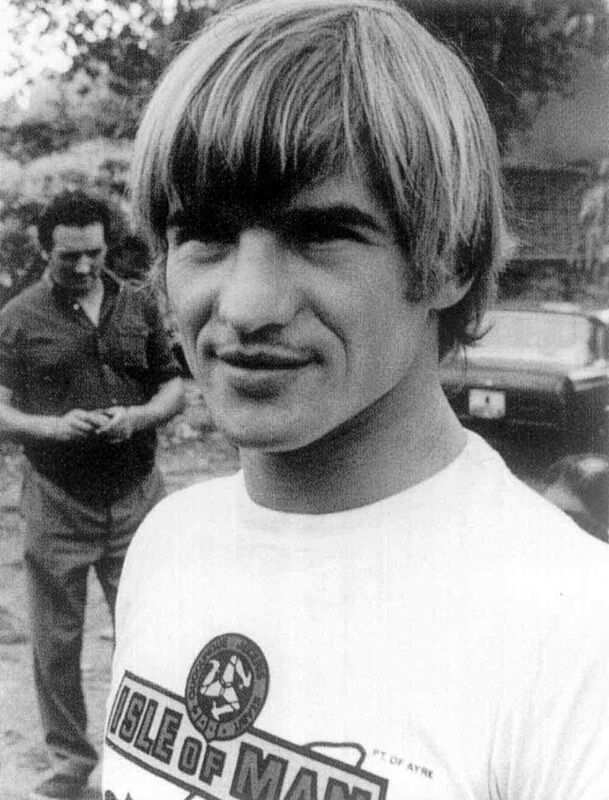 It was the beginning of a stellar career, one that ended with Nieto reaching an elite level with 13 World Championships., six in the 50cc class and seven in the 125cc class, a figure only bettered by the great Giacomo Agostini with 15 World Championships. However, it was a rider by the name of Santiago Herrero that looked most likely to win Spain’s first World Championship. Born in Madrid on May 2nd, 1942, Santiago bought his first motorcycle at the age of twelve and in 1962 obtained a racing licence. 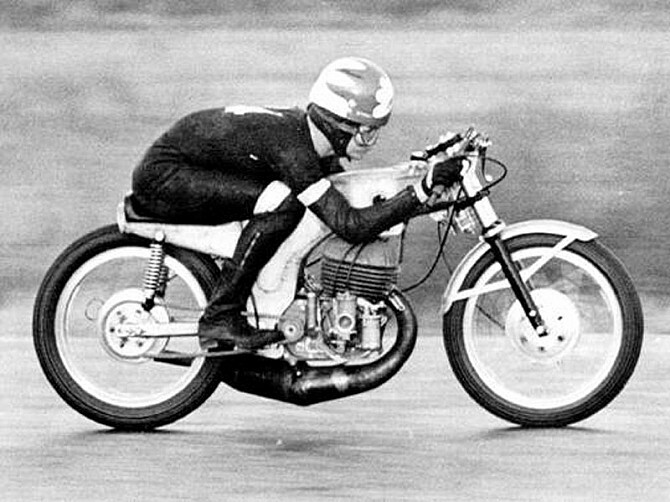 Initially competing on a Derbi Gran Sport and acting as his own mechanic, Herero then started racing a 125cc Bultaco Tralla. This brought him to the attention of Luis Bejarano the founder and owner of Spanish brand Lube motorcycles. Bejarano offered Santiago a position in his competition department and in 1964 Herrero repaid that confidence by finishing in third place on a Lube Renn in the Spanish 125cc Championship and then backed up the result with a second place in 1965. Difficult financial times under Franco’s reign saw the Lube marque go out of business. Santiago decided to work for himself and opened a motorcycle repair shop in Bilbao. Herrero continued to compete as a privateer racing the Lube Renn a Bultaco Tralla and TSS in national events. At the end of 1966, he was approached by another Spanish manufacturer Ossa. Founded by Manuel Giro the company had survived the difficult times of the early 1960s and thanks to the engineering genius of Manuel’s son, Eduardo, the company had developed road racing aspirations having already tasted success in endurance events. Some early shakedown runs on the monocoque Ossa. Note the Telesco forks and front brake from the 230cc Sport. It was the dream of winning the 250cc World Championship that inspired Eduardo to start design studies for a new Grand Prix challenger in 1966, and he even considered taking on Yamaha’s RD05 with his own two-stroke V4, but the cost was beyond the budget at his disposal. The answer was to build a simpler solution using the proven philosophy of lightweight, a small frontal area and engine reliability combined with outstanding handling. Following company ideology, the engine would be a single cylinder two-stroke of 249cc with a bore and stroke of 70x65mm. But unlike the piston port road models, a more accurate rotary disc valve was used for induction, which was fed by a massive 42mm Amal carburettor. An equally enormous expansion chamber exited on the left side of the engine, and a beefy air-cooled seven-fin barrel and cylinder head gave the illusion of a much bigger engine. Ignition was by an electronic Motoplat unit while the gearbox used six gears and was engaged by a dry clutch. But it was the chassis that moved away from convention. Unique for the era was its welded monocoque construction of magnesium and aluminium sheets that incorporated the fuel tank. The engine was mounted from a lug welded behind the steering head to another lug cast into the cylinder head, the chassis then swooped down and attached to the rear of the crankcases and incorporated the pivot point for the chrome molybdenum steel swingarm. Initially, oleo-pneumatic shock absorbers were used with proprietary Telesco front forks while the front brake of the road going 230cc Sport model was utilised. The 97.5kg racer produced 42bhp at 11,000rpm and boasted strong torque from as low as 6,500rpm. Nonetheless, it still gave away over 20hp to the Yamaha V4’s. The innovative Grand Prix racer had its first trial by fire at the 1967 Spanish Grand Prix at Montjuich Park and was ridden by Ossa factory rider Carlos Giro. Although sixth place was encouraging, Giro was a lap down to Phil Read on the Yamaha V4. Eduardo knew that on a tight circuit that should have suited the Ossa, they really needed to be further towards the front. Meanwhile, Herrero continued to help with development work on the G.P. racer while contesting the 250cc National Spanish Championship eventually becoming the 1967 Champion. However, politics were about to come into play with the Fédération Internationale de Motocyclisme issuing new regulations, which would limit the number of cylinders, gears and minimum weight for the different capacity classes from the 1969 season. The governing body of motorcycle sport was attempting to curb the costly technology war that was being waged between the Japanese factory teams and level the playing field for the European manufacturers. Honda withdrew after the 1967 season followed by Suzuki although Yamaha continued on with factory team until the end of the 1968 season. This would give Ossa a better chance of Grand Prix glory although they still had to deal with the V4’s of Read and Ivy during the 1968 season. A good view of the unique chassis, engine and dry clutch. The first Grand Prix of the year was the German round at the Nurburgring, a high-speed circuit more suited to the Yamaha V4 of Ivy and Read. Herrero, though, managed a creditable sixth place a lap down. Next was the Spanish round at Montjuich Park where Herrero qualified 5thand actually led the race but was let down by the oleo-pneumatic rear shocks that failed causing him to crash on lap 8. These were discarded and eventually replaced with British Girling shock absorbers. Some consolation was found for Ossa though, with their second-string rider Carlos Giro coming home in fourth position. Next was the TT at the Isle of Man with Herrero finishing in a commendable 7thplace for his first time at the island, with Ivy taking the win and Santiago named as the top rookie for the class. Ossa, however, tasted victory for the first time at the TT in the 250cc production race. English Ossa importer Eric Houseley had entered a 230cc Sport for Trevor Burgess in the event, who rode it to victory over the demanding 60.7Km (37.73 miles) mountain course. Herrero scored another 6thplace at the Dutch TT at Assen, which was again won by Ivy on the V4 Yamaha, and followed this up with a 5thplace at the hi-speed Spa-Francorchamps circuit in Belgium. Herrero, unfortunately, suffered a DNF at the next round at the Sachsenring in East Germany and also missed the next three Grand Prix’, but returned for the final race of the season, the Nations Grand Prix at Monza in Italy. Herrero claimed an outstanding 3rdplace on another high-speed circuit, which was won by Read ahead of Ivy on their V4’s. Read pipped Ivy to the World Championship with Herrero a credible 7th place. Ossa also secured a well deserved fourth place in the Constructors World Championship. Development of the Ossa racer continued and by now sported Italian Ceriano front forks and four leading shoe front brake with British Girling shock absorbers at the rear. This increased the weight of the machine from 97.5kg to 99.6kg but the improved handling and braking more than made up for the additional weight. The massive 42mm Amal carburettor. The fuel was inducted via a rotary disk valve. 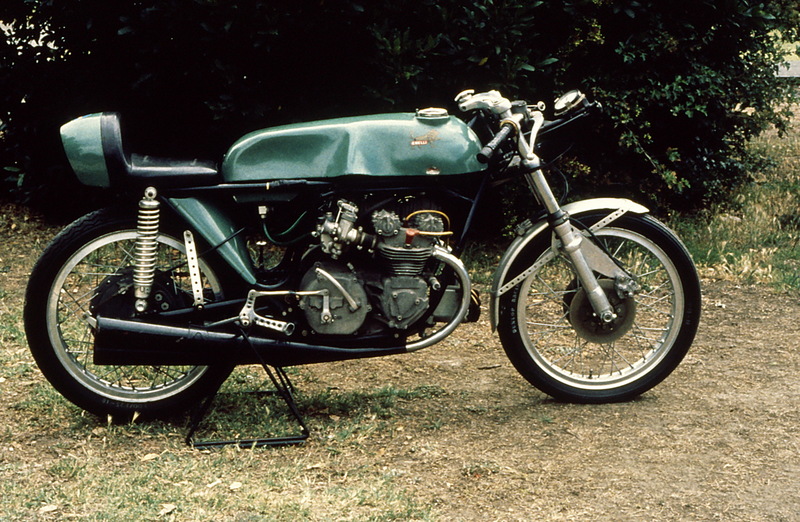 Although Yamaha withdrew works entries for the 1969 season they had been developing the parallel twin cylinder TD2 two-stroke production racer that was made available to privateers. Dutch Yamaha importer, Yamaha NV entered the talented duo of Rod Gould and Kent Anderson on TD2’s. 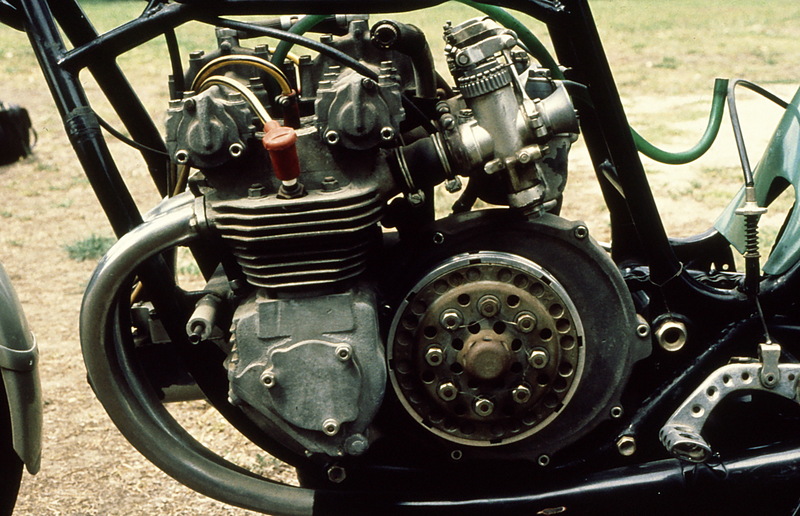 The East German MZ factory was also a threat with their fast but fragile rotary disc valve two-stroke twins, while the Italian Benelli factory had their works four-cylinder four-stroke racers to compete with, in a last-gasp chance to win the title before the rollout of the new regulations made them redundant for the 1970 season. The pundits favourite for the championship that season was Benelli’s Renzo Pasolini who had won seven races in the Italian season openers. This would in no way be an easy campaign for Herrero and the Ossa. The first race of the 1969 season was the Spanish round held for the first time on the tight and twisty Jarama circuit near Madrid. In wet and drizzly conditions, and much to the delight of the partisan crowd, Herrero won his and Ossa’s first Grand Prix. It was Spain’s first win in the 250cc class – Herrero becoming only the second Spaniard to win a Grand Prix. Sweden’s Kent Anderson finished second on his importer supported Yamaha twin nearly 25 seconds behind. Next was at the West German Grand Prix at Hockenheim. Pasolini, unfortunately, suffered a crash in practice, which was severe enough to put him out for three Grand Prix’. Kent Anderson went on to notch up the first win for the TD2 while Herrero suffered a DNF with ignition failure. Santiago bounced back at the French Grand Prix at Le Mans, winning the race and leading home second place man Rodney Gould on his Yamaha twin by nearly 42 seconds with Kent Anderson third. Benelli by now had drafted privateer, Australian Kel Carruthers, and Phil Read into the team for the next round at the Isle of Man. It was Herrero’s second visit to the TT and experience no doubt helped him to an outstanding third place behind Carruthers on the Benelli and Frank Perris on a Suzuki. 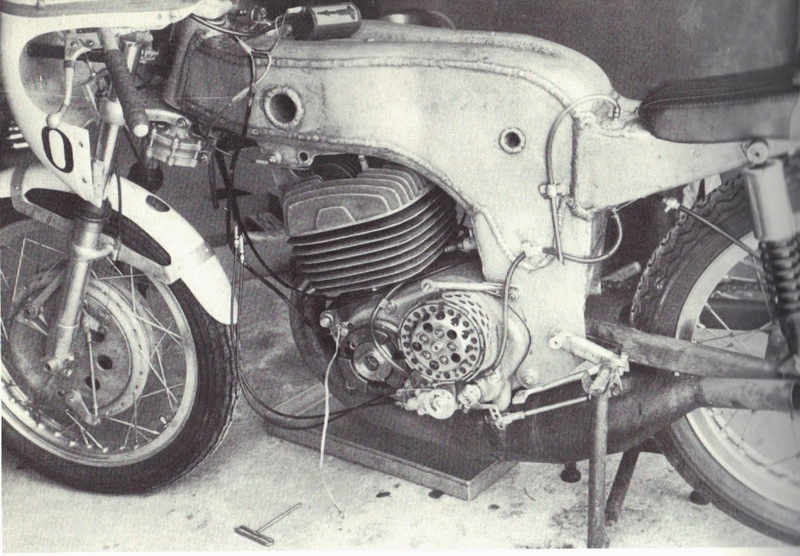 Meanwhile, the Ossa factory continued development of the 250cc racer by water-cooling the head and block of the engine, which reputedly enabled it to produce 48bhp at 10,500rpm. This version made an appearance at the Dutch TT round; Herrero though chose to stick with his tried and tested air-cooled engine. The water-cooled version of the 250cc Ossa. Pasolini returned at Assen and duly went on to win the Dutch TT. His new teammate, Kel Carruthers was second with Herrero an excellent third place 26 seconds behind the two works Benelli’s. Up next was the Belgium Grand Prix at the ultra-fast Spa-Francorchamps. Santiago underlined that he was a real contender for the championship, winning by a mere half a second from Rod Gould on his Yamaha but almost ten and a half seconds ahead of Carruthers on the Benelli. In fact, Herrero’s average race speed was faster than second placed man Percy Tait in the 500cc category! Things were hotting up with Pasolini winning again in East Germany at the Sachsenring with Herrero in second place a mere three-hundredths of a second behind with Rosner on an MZ in third. Czechoslovakia was next at the Brno circuit, and it was here Santiago’s championship campaign began to falter. Herrero’s Ossa suffered engine failure while Pasolini won again with Gould in second and Carruthers in third. Two weeks later the “continental circus” moved on to Imatra for the Finish Grand Prix. Pasolini had the misfortune to crash again putting himself out for the rest of the season. Herrero, however, could only manage sixth place, but more importantly, Carruthers finished fourth, and Kent Anderson took his second win of the season. The pressure was starting to mount on Ossa’s challenge. The trip to Northern Ireland for the Ulster Grand Prix at Dundrod must have been a pensive one for Santiago. He knew only the best seven results would count towards championship points and he needed at least one more good finish. It may have been self-imposed pressure to do well in the wet and rainy conditions that caused Herrero to crash, sadly breaking bones in his left hand. Carruthers notched his second win on the Benelli with Kent Anderson on the Yamaha third. Three weeks later at the Nations Grand Prix at Imola, Herrero, with his hand and forearm in a splint, could only manage fifth place. The championship was slipping away. Yamaha had drafted Phil Read on a factory-supplied twin to help Anderson in his title bid and duly won the race from Carruthers on the Benelli with Anderson in third place. Only one week later was the final race of the season; the Yugoslavian Grand Prix on the Adriatic street circuit of Opatija. For Herrero to have any chance to take the championship it had to be a win or nothing and poor results for his adversaries. Unluckily it ended with another crash for Santiago. To help Carruthers in his title bid Italian rider, Gilberto Parlotti was brought into the Benelli team. It would prove to be a masterstroke as Carruthers won the race followed home by Parlotti with Anderson in third. The final tally on adjusted Championship points was Carruthers, in first place on 89, Anderson, in second place on 84, and Herrero, in third place on 83. Ossa also claimed third place in the Constructors Championship. 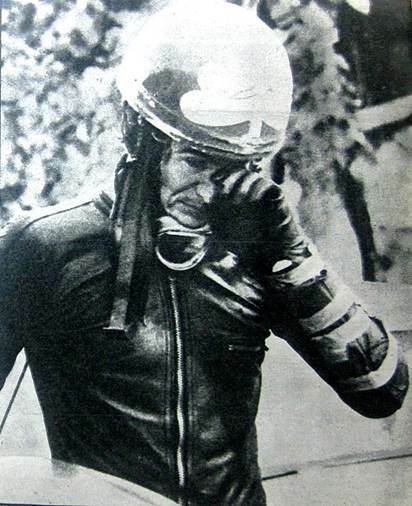 Arm in a splint, Herrero is distraught after crashing out of the Yugoslavian Grand Prix. Nonetheless, 1969 was a season of accomplishment for Herrero and Ossa. Santiago had won his third consecutive 250cc Spanish National Championship. He had also been drafted into the Spanish Derbi team in the 50cc class of the World Championship finishing 7th in Holland, 2ndin Belguim and 2ndin East Germany. His results helped his friend Angel Nieto to his first 50cc World Championship and Spanish manufacturer Derbi to their first constructor’s title. Although only entering three 50cc Grand Prix’, Herrero finished 7thin the championship. Herrero and Ossa entered into the 1970 season with a certain amount of optimism. Pasolini and Benelli would concentrate on the 350cc class due to the regulation changes that only allowed machinery with a maximum of two cylinders to compete in the 250cc category. Santiago still faced stiff competition from an armada of private, dealer and importer supported Yamaha’s and MZ could still be a threat, even though the OSSA was by now making 45bhp in air-cooled form. Herrero’s season got off to a shaky start with mechanical problems causing his retirement from the West German Grand Prix at the torturous Nurburgring. Santiago then put in one of the rides of his life in the French Grand Prix at Le Mans. Herrero crashed while pushing too hard to try and make up for the speed differential between the Ossa and the Yamaha’s. He remounted his battered machine and in a superhuman effort fought his way up to second place setting the fastest lap of the race. Next was the Adriatica Grand Prix at the Yugoslavian seaside town of Opatija. Santiago once again proved he had the makings of a World Champion winning the race by four seconds from Kent Anderson with Rod Gould in third. Herrero led the Championship by two points as the “continental circus” headed once more to the Isle of Man. Although Yamaha’s TD2 had proven fragile at the TT the previous year, a season of development and the sheer number of competitors racing them put the odds against success for Herrero and the Ossa. In the early stages of the race he could only manage fifth place and while pushing too hard took the slip road at Braddan Bridge. Santiago dropped the bike breaking the screen. He restarted and by the last lap had clawed his way up to third place. As Herrero tried to take the fast but difficult double left-hander at the thirteenth milestone before Kirkmicheal, a section of melted tar put the OSSA into a wobble and a slide that he was unable to recover. Stanley Woods was following Herrero and witnessed the accident before becoming entangled himself trying to avoid man and machine, ending up with a broken ankle, leg and collarbone. Santiago suffered severe head and internal injuries and was airlifted to Douglas but passed away two days later. Manuel and his son Eduardo withdrew Ossa from racing; his death had devastated the factory. The impact of his accident saw Spanish riders and the Spanish Federation, the RFME, boycott the TT for twenty years. Spain had lost one of its pioneer’s of Grand Prix racing and an outstanding developmental rider. Few would disagree that Herrero could have one day been a World Champion. This entry was posted in Motorcycle Racing, Motorcycling and tagged 250cc World Championship, Benelli, Bill Ivy, Eduardo Giro, Kel Carruthers, Kent Anderson, Manuel Giro, Monocoque chassis, MZ, OSSA, Phil Read, Renzo Pasolini, Rod Gould, Santiago Herrero, Yamaha RD05, Yamaha TD2 on 09/04/2018 by Geoff Dawes. There is something reassuring about museums, be they public or private collections, as they offer an open window into another time that can be shared by all. The curators and private collectors are the gatekeepers of worlds past, and this is never more true when it comes to motorcycle collections. I was fortunate enough to visit the Peterborough Motorcycle and Antique Museum recently, which is situated in the mid-north of South Australia. Peterborough is approximately 260km north of the city of Adelaide and a pleasant three-hour drive on the A32, which is part of the Barrier Hwy to Broken Hill. 1962 50cc Malanca made in Italy. Located on the comer of Kitchener and Jervois street, just off the main road, the museum is housed in a former historic Baptist Church and offers bed and breakfast accommodation in the separate Tennyson Hall, which was built in 1913 as a men’s prayer room. 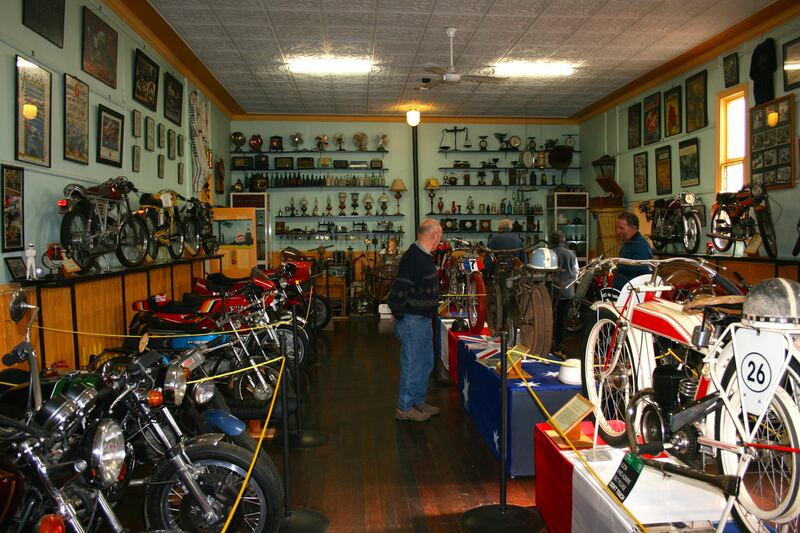 Ian and Belinda Spooner opened the museum in 2008, and as well as housing numerous interesting antiques, the majority of space is taken up by Ian’s collection of motorcycles, many of which have never been seen or heard of in Australia. Ian started buying motorcycles in his teens, and although the word “collector” was not mentioned, he simply admitted that he “couldn’t get rid of anything”. And Ian continues to add to his inventory to the point where the church hall is putting some constraint on how much can be displayed. The 1927 France GP racer. The first thing that is noticeable about the exhibits is the large number of impressive small capacity European made two-strokes from the 50’s, 60’s, and 1970’s. This is offset, to a degree, by machines like the 1981 1000cc Laverda Jota triple and a 1971 Honda 750 automatic, which was sold in the U.S. but never made its way to Australia. Ian also has on display several French vintage racing motorcycles in the shape of a very rare 1921 Yvels with a 250cc Villiers racing engine and a France which used a 350cc Jap engine. Another fascinating machine is a recreation of a 1939 water-cooled and supercharged 250cc Benelli Grand Prix racer. The replica was literally hand built by a nautical engineer over 15 years, using a four-cylinder 250cc Yamaha engine as the basis for the powerplant. 1939 Supercharged 250cc Benelli GP replica. 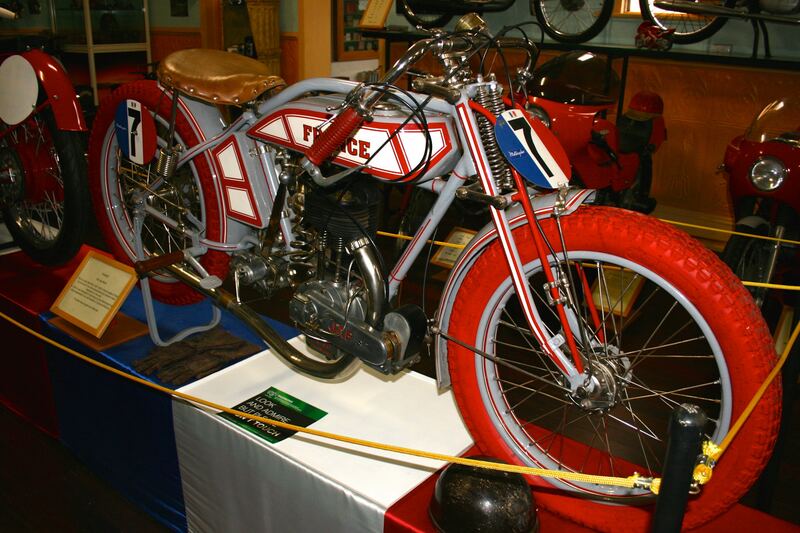 Also on display is a collection of motorcycle memorabilia in the shape of photo’s, posters and signs. But one item that did catch my eye was a set of white leathers hanging on the wall. I recognised these as belonging to 5 times 500c Grand Prix winner Dutch rider Wil Hartog. Hartog came to Australia for the Swan International Series in the late 1970’s bringing with him the daunting Suzuki RG680cc racer. A round of the series was held at the Adelaide International Raceway, and during unofficial practice I witnessed Hartog lose the front on the approach to the speedbowl, which unfortunately broke his collarbone and ended his series campaign. 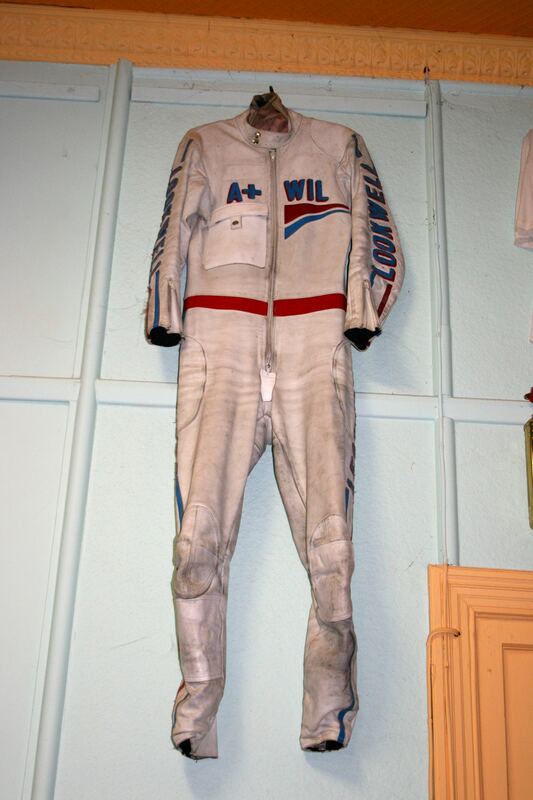 Hartog gave the leathers to a friend of Ian’s with whom Hartog had stayed while in Adelaide. leathers, complete with scuff marks on the left shoulder. Ian’s enthusiasm for his motorcycles and displays is contagious, and he takes the time to talk to his visitors about the many exhibits on show. For me, the museum was well worth the trip alone, but the town and surrounding area also have a lot to offer. Peterborough was once an important regional railway hub and the Steamtown Heritage Museum displays steam trains and carriages of this bygone era with the added attraction of a sound and light show. At Hallet on the A32, there is the opportunity to visit Sir Hubert Wilkins birthplace. The Famous South Australian was a celebrated war photographer, aviator and polar explorer and there is, of course, the historic former copper mining town of Burra to explore while just thirty minutes away is Clare with its world-class wineries and excellent food. Words Geoff Dawes © 2015. Photographs Geoff Dawes © 2015. Below is a link to the Peterborough Motorcycle and Antique Museum website and to google maps for the Adelaide to Peterborough route. 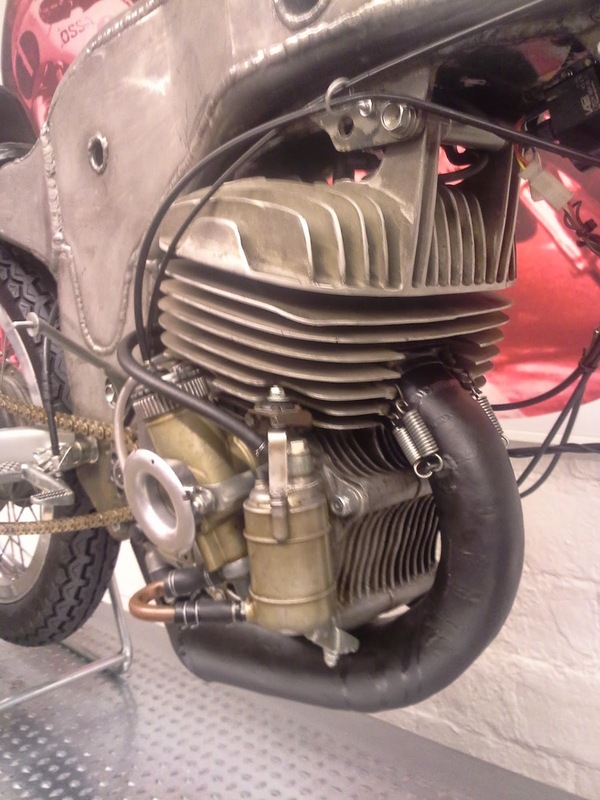 This entry was posted in Motorcycling and tagged Benelli, France, Grand Prix Racer, Honda 750 Automatic, Laverda Jota, Malanca, Peterborough Motorcycle Museum, Supercharged, Wil Hartog, Yvels on 06/09/2015 by Geoff Dawes. 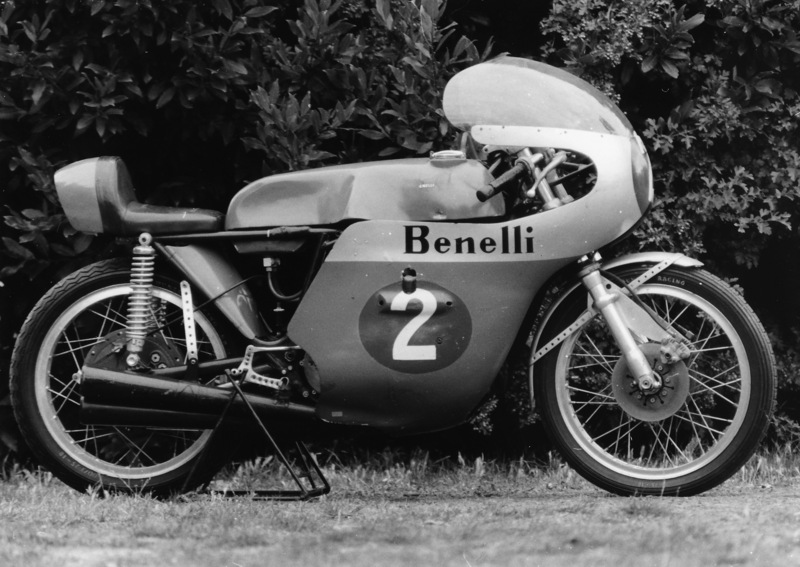 It was in the mid-1970’s that I first stumbled across the exotic little Benelli 250cc GP bike. I’d made my usual pilgrimage to South Australia’s motorcycling mecca, which at that time was Adelaide’s Pirie Street, where I spotted the green and silver racer. It was prominently displayed in the doorway of one of the many motorcycle shops that had come and gone over the years and whose name now eludes me. The price tag tied to the alloy clip-on handlebar said $3,200, which seemed a lot considering I’d paid “only” $1,800 for a new Z1 900 Kawasaki, although I had no idea at the time of how rare the Benelli was. My second encounter was some years later during a visit to South Australia’s Birdwood Mill National Motor Museum, nestled in the Adelaide Hills. Taking pride of place in the motorcycle display was the Benelli, but more surprising was a sign declaring it to be Australian Kel Carruthers’ 1969 250cc World Championship winning bike! Over the years since that second chance meeting I’ve found the idea of a rare “works” racer – and a world championship winning one at that – finding its way into an Adelaide motorcycle shop extremely intriguing. With my curiosity finally getting the better of me I decided to ring Jon Chittleborough, the curator of the motor museum, with the intention of putting together an article on the said GP racer. Jon confirmed that the bike was still on display at the museum and that I was quite welcome to come along and photograph it. But since becoming curator, he had been unable to confirm if the Benelli was, in fact, Carruthers’ championship winning bike as its past was somewhat foggy. But before we go any further a brief description of the 250 fours, evolution is perhaps called for. It was in mid-1960’s that Giovanni Benelli and Ing Savelli introduced an entirely new design four-cylinder 250cc GP machine that would eventually replace their ageing D.O.H.C. single. In true fifties’ style the prototypes chassis was rather bulky and over-engineered, while on the other hand, the rim sizes were a narrow 2.590 x 18 front, with a matching 2.75 section rear. The engine was a dry sump design with vertical cylinders, double-overhead camshafts and two valves per cylinder. Bore and stroke measured 44 x 40.6mm for a capacity of 246.8cc, which was retained up to Carruthers’ world title-winner. Benelli claimed 122kg (268lb) dry weight for the bike and 40bhp at 13,000rpm, which compared quite well with the contemporary Honda of the day. Benelli continued to rely on an updated version of their D.O.H.C. 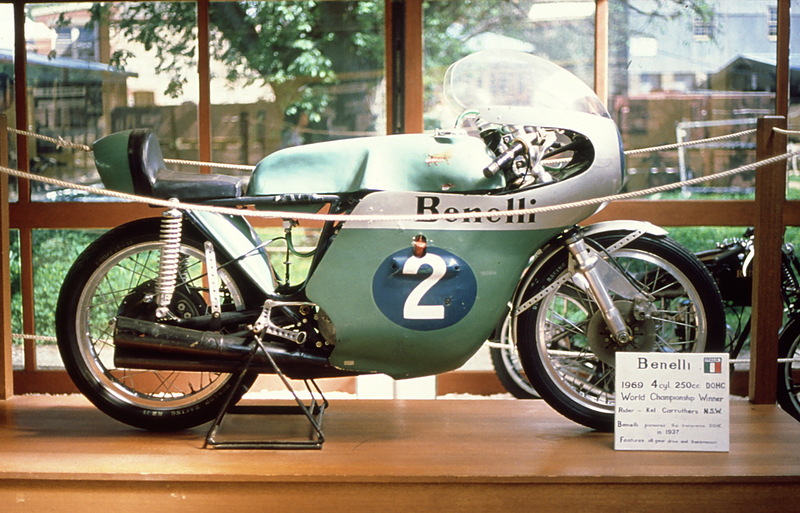 single during 1961 while they refined the untried four, so it was not until 1962 that the Benelli made its racing debut in the hands of works rider Silvio Grassetti. Many changes had been made to the machine since its first appearance, mainly the removal of the oil tank from under the seat in favour of a large-capacity bolt-on sump with a two-way pump mounted above it, and running off the camshaft drive pinion. Ignition on the prototype had been by battery and four coils with the points driven off the end of the inlet camshaft. This system had proved unsuitable as the four-lobe contact-breaker points tended to float at high rpm effectively reducing the engines ability to reach maximum revs. A Lucas magneto was installed on the right front side of the crankcase and bevel-driven of the camshaft pinion, which also had the desirable effect of reducing weight. The chassis was also partly redesigned and slightly wider sections tyres fitted. 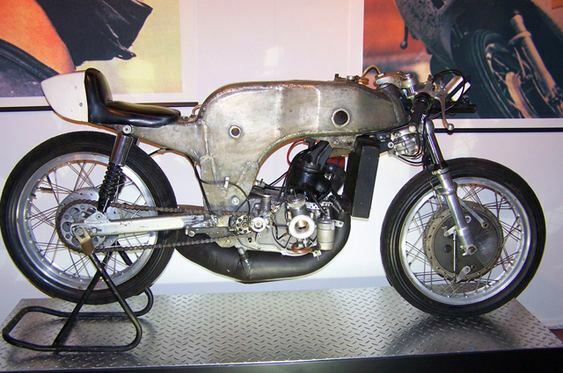 The Lucas magneto fitted to the earlier model of the 250cc GP racer. 1964 saw the great Italian rider Tarquinio Provini join the team. He had been runner-up in the previous year’s title riding a supposedly obsolete Morini single, only losing out at the last round in Japan to Jim Redman’s Honda four after each had won four races apiece. The former two times world champions influence at Benelli was soon apparent with the factory completely redeveloping the bike. The frame was made smaller and lighter helping to bring the overall weight down to 112kg (264lb) dry. New camshafts were installed which raised the rev limit and narrowed the power-band giving 48bhp 14,500rpm. To compensate for this, a seven-speed gearbox replaced the original six-speed unit. Two pairs of 20mm Dell’Orto’s provided Carburation with a single flat-sided float bowl between each pair. Provini was the first to reap the rewards of these changes by defeating the Honda, Suzuki and Yamaha factory teams at the opening European GP held in Barcelona’s Montjuich Park, although the rest of the season only produced fourth and two-fifth places respectively. More alterations were made for 1965, with modified inlet and exhaust ports for better breathing, and new camshafts offering greater lift and dwell. Combustion chambers and piston crowns were given more squish area, while more substantial 24mm carburettors were fitted with specially tuned bell-mouths that gave an extra 2bhp. Usable power now started at 8,500rpm and lasted to 14,500rpm at which point it was producing 52bhp. However, the most significant change came in the form of a new magneto from a Mercury two-stroke outboard motor, modified for four-stroke use. 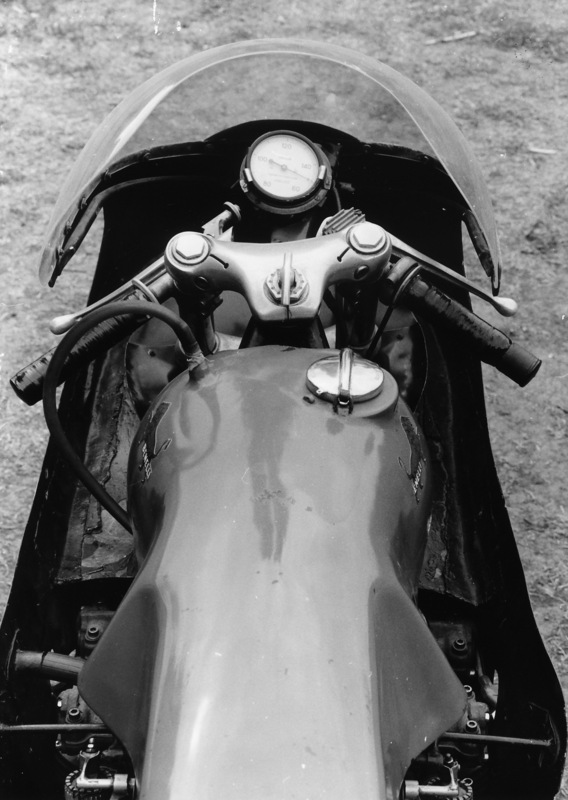 The Lucas unit had been initially designed for the lower revving 350, and 500 fours produced by Gilera and MV in the 1950’s and proved unreliable when engine speeds went over 12,000rpm. The American made unit solved the problem and was retained to the end of the model’s development, although some experimentation was done with an early form of electronic ignition. The chassis was also modified for 1965, being lowered and shortened even more, and equipped for the first time with disc brakes. 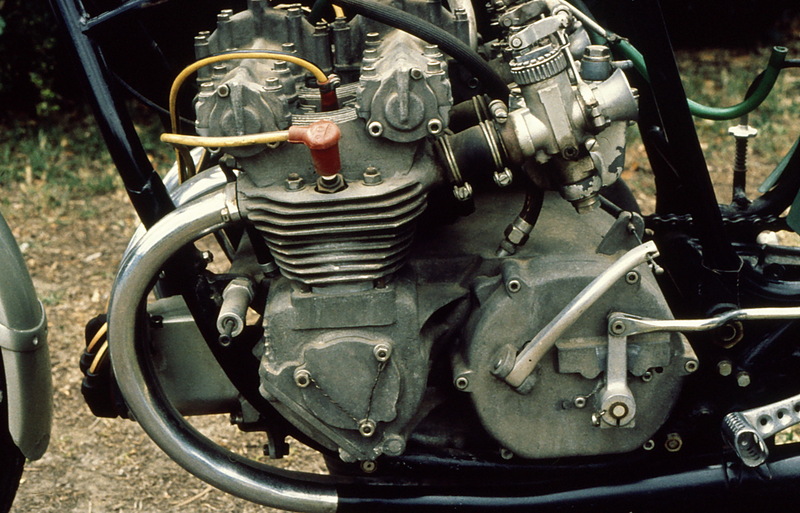 Benelli was one of the first in GP racing to adopt this now universal feature. 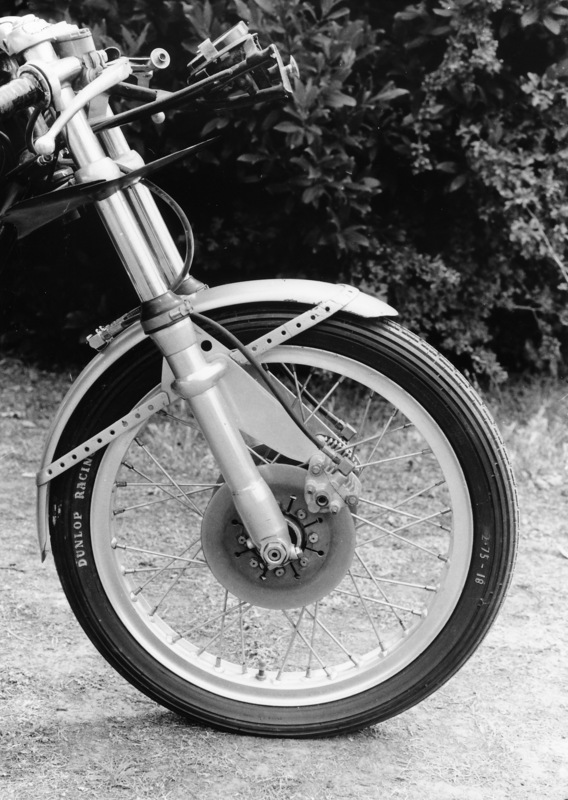 Unfortunately, the US made Airheart disc brakes were designed initially for go-kart use, and this, plus a lack of brake pad choice, resulted in the twin 7in discs being insufficient to stop a 112kg motorcycle at 143mph, which the Benelli was by then was capable of. By the end of the season, the team had reverted to drum brakes all round, especially after suffering braking problems in the pouring rain during the Italian GP at Monza, which nonetheless did not stop Provini winning convincingly by lapping every other finisher on the Italian four. Meanwhile, the desperate struggle for supremacy in the 250cc class raged between Honda and Yamaha, accelerating development of their race bikes. 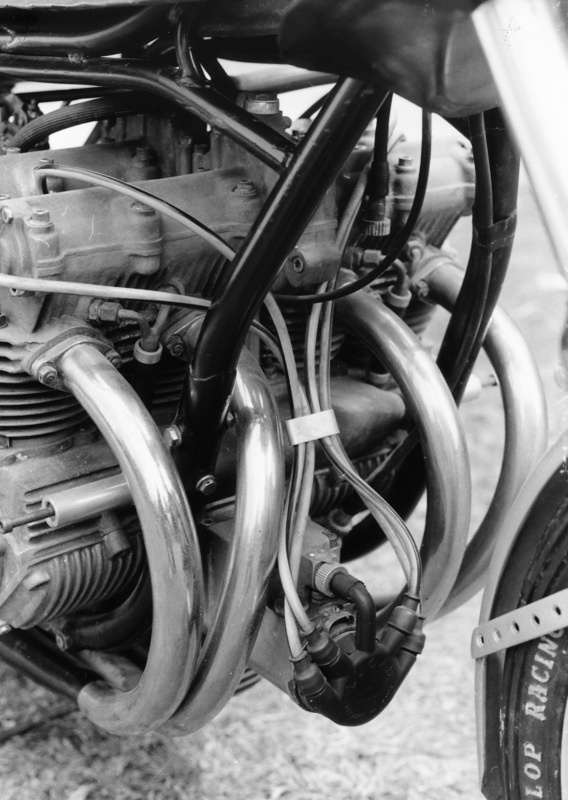 Honda’s 250cc six-cylinder was now producing 60bhp and starting to handle thanks to the talents of Mike Hailwood. Benelli had to do something if they were not to be left behind. Ing Savelli’s answer was to introduce a stop-gap model in the winter of 65/66 with three valves per cylinder, using two inlet and one exhaust. This helped to increase bottom-end torque but not top-end power, so inevitably a leaf was taken out of Honda’s book, and four valves per cylinder were adopted. This narrowed the power band again but increased maximum safe revs to 16,000 and boosted the engine’s output to 55bhp. It was on this machine, now painted slate grey instead of Benelli’s more colourful green, that Provini won their third consecutive Italian national title but failed to make any impression on the Japanese bikes in the Grands Prix. Then tragically, while practising for the 1966 TT at the Isle of Man, Provini crashed and seriously injured his back ending a great racing career. This was a severe blow to Benelli, but they decided to continue on and enlisted Aermacchi rider Renzo Pasolini for 1967, although it was not until 1968 that he started to show his full potential on the 250 by winning the Italian title and coming second in the TT. By 1969 both Honda, Suzuki and Yamaha had withdrawn from GP racing giving Benelli perhaps their best chance at the title. Pasolini proved as much by winning all seven races of the keenly contested Italian season-openers and was the pundits choice for the world championship. Sadly, he crashed in practice for the second GP at Hockenheim and was injured seriously enough to miss the first three GP’s, including the important Isle of Man TT. The Benelli has a purposeful look. The Spanish Ossa factories remarkable monocoque two-stroke single, in the hands of Santiago Herrero, easily led the championship, forcing Benelli team manager Nardi Dei to enlist the services of reigning world champion Phil Read and privateer Aussie Kel Carruthers’ for the TT. Read retired during the race, but Carruthers’ swept to victory more than three minutes ahead of Frank Perris’ Suzuki. Kel was rewarded with a place on the team for the rest of the season even after Pasolini returned to win the next GP in Holland. By this time Herrero’s challenge had begun to wane, and it was left to the two Benelli riders to slug out the remaining rounds. Unfortunately, Pasolini fell again in Finland putting himself out for the rest of the season. Carruthers then became team leader, and his less powerful two-valve engine was replaced with the eight-speed four-valve unit, which he used to notch up two wins and two-second places in the remaining four rounds to take out the world title. American made Airheart disk brakes were initially designed for go-karts. It was indeed the 250 fours swan-song, winning the championship at its last gasp. The FIM in their wisdom had changed the rules at the end of 1969 for the 1970 season, limiting the 250 class to two cylinders and six gears, which also prevented Benelli from showing off its mind-boggling prototype 250cc V8 racer in public. As the amiable Jon Chittleborough and I sat down in his office at the Birdwood Mill Motor Museum, it became apparent that there was quite a bit of mystery surrounding this particular Benelli. Unfortunately, the racer was obtained when the museum was still in private hands, and there’s very little in the way of records to go by. Jon has written to the Benelli factory in the hope of finding out a little more of the 250’s history, but regrettably Benelli English is even worse than the fabled Ducati English! It is known, however, that the GP racer was brought into this country via Melbourne, probably by John Skepper of Zeltex Imports, who it’s thought was the importer of Benelli at that time. The Museum acquired the Benelli as a straight swap for a 1927 DS Harley Davidson after the local agents were unable to sell it. 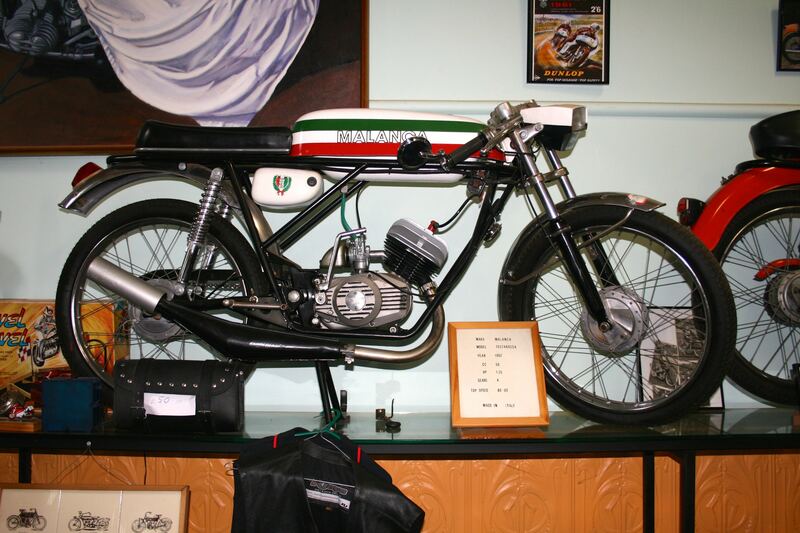 A previous employee of the Museum believed the Benelli was obtained from Carcycle (now Peter Stevens Motorcycles). But after checking with Mike Harris and Jim Russell (who had both been with Carcycle and its subsidiary sales team for over 20 years), this proved to be untrue, although Jim vaguely recalled seeing it for sale across the street in a shop that traded under the name of “Maintenance Services”. The jewel-like engine is extremely compact. Before the swap with the museum could go ahead, the importers had to get approval from the Benelli factory, which they did with the understanding that the 250 would not be raced. This brings us to the next part of our mystery and probably the saddest part of the story. The museums’ Benelli has had its engine entirely gutted. Whether this was done before the bike left Italy or after it arrived in Australia is not known for sure,. Although former road racer John Maher did tell the Museum he was offered a ride on the 250 GP racer by John Skepper when a Benelli 750cc six failed to show up in time for the Castrol Six-Hour production race. It also confirms what I was told by the salesman at the motorcycle shop, who had assured me that the bike was still competitive with the production TZ Yamaha of the time. This creates the possibility that the engine parts could still be lying around in a dusty corner of someone’s garage. Perhaps the most contentious issue is whether the museums 250 was the one used to win the 1969 World Championship. Both Jon and I agreed it was probably an earlier model, possibly 1965 as it’s fitted with the Airheart disc brakes, Lucas magneto, and “straight” megaphones of that vintage. To add credence to this, about eleven years ago, Derek Pickard of Road and Race magazine visited the museum. He opined the view that it’s the bike that took Venturi to fourth place in 65/66 Italian Championships. Nonetheless, it’s still a very rare motorcycle. It even prompting seven times World Champion, John Surtees, to approach the museum in an attempt to acquire the 250 to add to the 500 he has on loan from the factory as there are very few “complete” 250cc fours in existence. 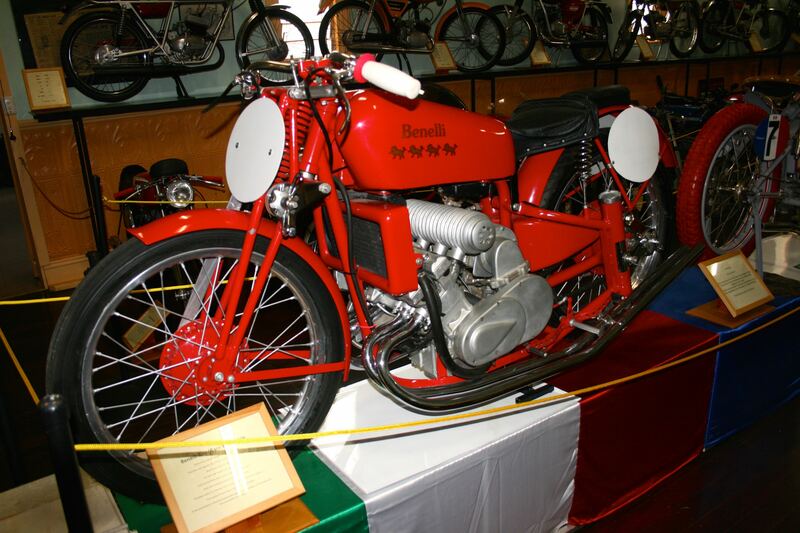 However, the museum would love to hear from anyone who can shed any further light on the Benelli, especially with regards to the missing engine parts as the museum would like to fully restore the 250. The museum can be contacted by writing to The Curator, Australian National Motor Museum, Main Street, Birdwood South Australia 5234. Words Geoff Dawes (c) 1989. Photographs Geoff Dawes (C) 1989. Published in the November 1989 issue of Bike Australia. This entry was posted in Motorcycling and tagged Benelli, Giovanni Benelli, Grand Prix motorcycle racing, Renzo Pasolini, Silvio Grassetti, South Australia, Tarquinio Provini on 18/09/2013 by Geoff Dawes. Australian Motorcyclist The best motorcycle travel magazine in oz.